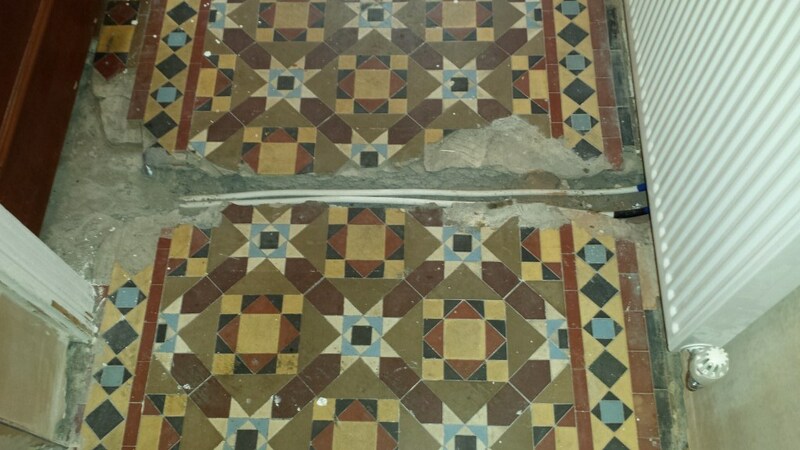 This is an original Victorian tiled hallway floor in Cardiff that dated back to when the house was built in the year of 1890. The previous householders of which had a radiator installed serviced by laying pipes right through the middle of the floor destroying the tiles as they went, they then back filled the channel with cement. On top of that many of the other tiles had been splashed with cement and paint. My first job was to carefully remove the cement from the channel and to precisely cut back any old cement bedding and old cement grout away from any tile edges in preparation for the replacement tiles which fortunately I was able to get hold of. After all the previous preparation I started carefully scraping off cement from all around the edges of the remaining tiles as well as gloss and emulsion splashes from the surface essentially giving the whole floor a thorough scrape with a hand held scraper vacuuming up the mess as I worked. Interestingly for a floor of its age I tested the floor in various places for moisture and found it to be perfectly dry. To clean the floor I mixed three parts Tile Doctor Remove and Go with NanoTech UltraClean which basically adds small abrasive particles to a powerful sealer and coatings remover making it even more effective. This was applied to the whole floor and left to soak in for an hour making sure not to let it dry out by applying further amounts; leaving it to dwell for an hour gives it time to eat away at any dirt and coatings on the tile making the scrubbing processes easier. To scrub the tiles I used a rotary machine fitted with a black scrubbing pad rinsing and extracting the soiled solution along the way. This cleaned up the tiles well however there were still some cement stains so this time Tile Doctor Grout Clean-up was applied to the floor in sections and left to ten minutes to dwell before working it in with another black scrubbing pad and rinsing off. This product is acid based so you can’t leave on the tiles for too long; once I was happy with the final result the whole floor was given a thorough rinse with plenty of clean water using a wet vacuum to extract the waste and dry the floor. 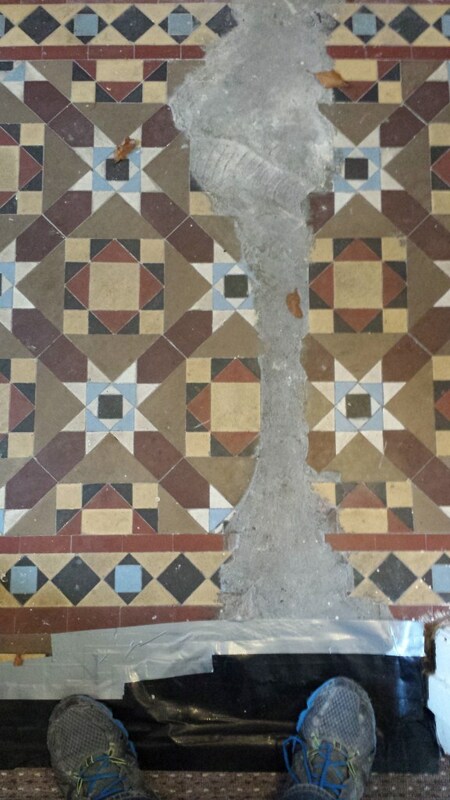 The channel was then filled with cement and once it had set replacement replica Victorian tiles from The Original Tile Company were installed. I then grouted the floor in a medium grey grout let the tiles become solid and the grout go hard before using a steam cleaner to make sure that I have removed all the tile doctor cleaning solutions prior to sealing. The customer wanted a semi-gloss finish so once I had tested the floor again to make sure it was dry I sealed the tiles with Tile Doctor Seal and Go which enhanced the colour of the floor tiles and added a nice sheen. As you can see the new tiles fitted beautifully and the old floor tiles cleaned up so successfully the difference is impossible to spot. It was a lot of painstaking work though taking five days to finish but well worth the result. 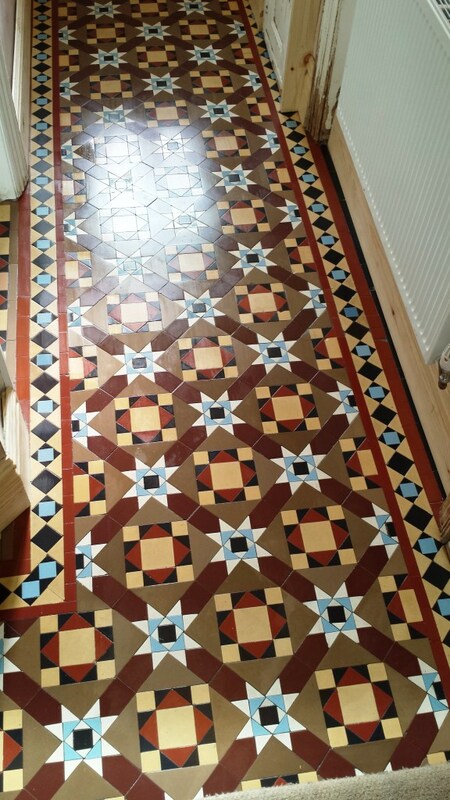 This entry was posted in Stone Sealing Products, Tile and Stone Problem Solvers, Tile Cleaning Products and tagged Cardiff, cleaning services, floor maintenance, hallway cleaning, South East Wales, tile cleaning, tile refurbish, tile restoration, tiled floor, victorian tiles by AbzDominise. Bookmark the permalink. 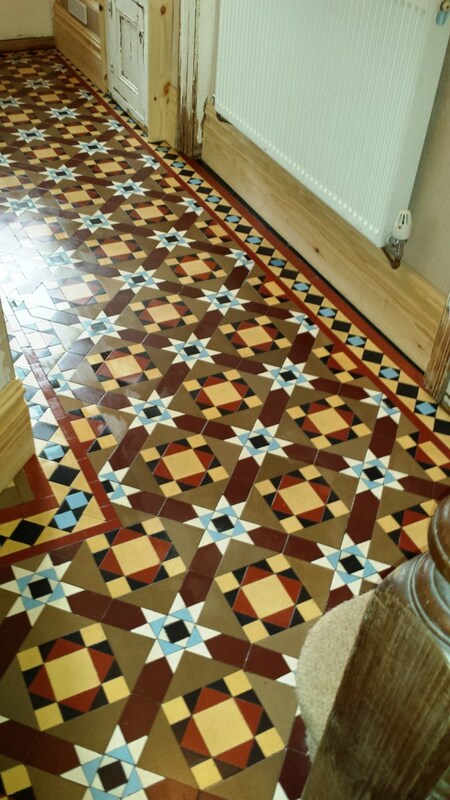 Nice work Julian, you should be up for a Tile Doctor Oscar for that job, the floor looks amazing.